Real Madrid fell to a frustrating 1-0 away loss in the Champions League to Russian giants CSKA Moscow, on Tuesday night. Los Blancos went into Matchday 2 of the competition looking to make it two wins from two, having easily dispatched AS Roma two weeks ago. However, an early goal from the Russian side was enough to hand Madrid the first loss in this year’s Champions League. 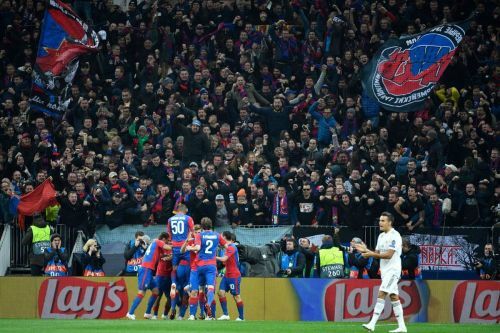 CSKA Moscow started off as the better side and surprisingly went ahead after just two minutes. Niko Vlasic took advantage of a mix-up in the Madrid defence to slot home the opener – a goal which the Russia side held on to till the end of the game. The result means that Real Madrid are now winless in their last three games in all competitions. Perhaps since the departure of Cristiano Ronaldo, this was the first time that Los Blancos truly missed the Portuguese. Denied of the services of Gareth Bale due to injury to the Welshman, the defending champions went into Tuesday’s game with a three-man attack of Karim Benzema, Marco Asensio and Lucas Vazquez. However, all three players lacked the attacking firepower to get past the CSKA Moscow defense. In a game which was highly tactical, the hosts referred to sit back and defend their early lead, limiting Madrid’s chances of an equaliser. Not even the late introduction of newly-crowned FIFA Best Player, Luka Modric, could help the club pull level. Currently, the group is wide open, with Roma and Real Madrid both having three points. Football fans have also been having their say following Real Madrid’s latest loss to CSKA Moscow. Whiles some believe the result could have been different with Ronaldo still at Madrid, others preferred to troll the European champions altogether. When was the last time Real Madrid lost a group stage game in the Champions League? The last time Real Madrid failed to score in three consecutive matches was back in the 2006-07 season, and the last time they failed to score in a Champions League match was in April 2016 against Manchester City (30 CL games ago). Is it oly United that is not allowed a bad spell or poor run of form because both Barca and Real Madrid are not doing it either but nobody seems to be talking about them. The almighty Real Madrid, the defending champion just lost to CSKA and nobody sees anything wrong with that? Real Madrid's 3 consecutive games without a goal. Don't laugh at Real Madrid. We are getting trashed by Spurs tomorrow. First goal came in at 2', whetting the appetite of bettors around the globe. 3 games without a goal for Real Madrid. No pressure though Julen, I mean the last guy only won the Champions League 3 times in a row. In last 6 games for Real Madrid’s first choice striker is really embarrassing. Real Madrid three games in a row without scoring. You'd think they'd lost one of the greatest goal scorers in history and not bothered to sign any high profile forwards to try and replace him. But that would be crazy.